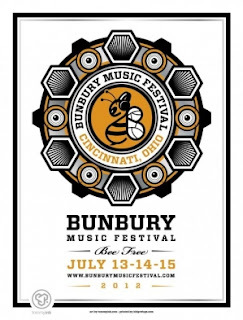 Well, Bunbury is over and in my opinion, the 3-day fest was a massive success in its first year. The headliners, Jane's Addiction, Weezer and Death Cab For Cutie (with DCFC reaching deep into their catalog) were as good as expected and the next level of bands like, Minus The Bear, Margot And The Nuclear So And So's, and Guided By Voices were just as great! Sadly, Passion Pit whose new album drops next week had to cancel and a short deluge of rain and lightning on Sunday threatened to derail the event, but bands like Ume, and their highly-charged live show and the Pomegrantes with their always great performance made some event-goers like myself forget all about that. Also, Cincinnati's Belle Histoire whose debut album, Dreamers is out today on InVogue Records, even played a short acoustic set on the side for fans waiting around for their rain-shortened set to begin. The band that surprised me the most was Cincinnati's own The Tillers and their punk-infused brand of old timey blues, gospel and bluegrass. The trio battled stage defeciencies and soldiered on to play the way they were meant to play when their microphone cut out for two songs. I hope that this fest helped other people to discover their new favorite band! Another thing that really impressed me was how well the whole event was planned and coordinated. For example, they didn't make up for the cheap tickets prices by gouging us with high prices for food and drinks ($2 for water!). 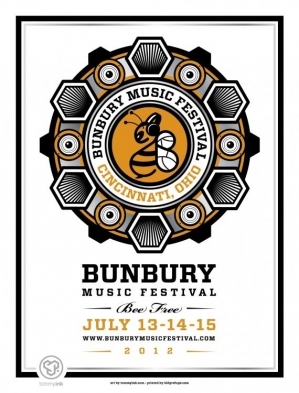 All in all, the Bunbury Music Festival was a great event for the city and for the local music scene and I cannot wait until Bunbury 2013!